White Paper Abstract: Wellness programs reduce healthcare costs, so cash- and benefit-based incentives to drive participation in these programs make good business sense. 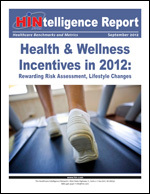 New market research from the Healthcare Intelligence Network has determined that the completion of a health risk assessment (HRA) remains the most heavily incented health improvement activity for the fourth consecutive year, say two-thirds of respondents to HIN‚s annual Health & Wellness Incentives Survey. Download this HINtelligence report to learn more about the incentives programs being offered by 136 healthcare companies, including types of incentives, program communication modalities, who's eligible for the incentives, and much more. This HINtelligence Report provides data highlights on health and wellness incentive program components, results, and ROI; as well as the most successful strategies for health and wellness incentives use. Customized reports, including benchmark results by industry sector, are available upon request.